Your organization can distinguish itself from your competitors by circumventing potentially adverse situations before they become realities. Minimizing supplier-related risk will maximize your compliance and quality improvement activities, thereby growing customer trust and brand loyalty which will ultimately increase your organization’s bottom line. You’re probably conducting incoming inspections today. Taking a risk-based approach to these inspections reduces your chances of performing unnecessary inspections and helps you identify and target items which need to be inspected most. Implementing a risk-based sampling system (based on the criticality of risk identified in your risk files) helps you spend less time and money inspecting high-quality raw materials when you are confident that they meet or exceed quality standards. This also gives you the ability to pinpoint low performing raw materials and suppliers based on their inspection state. A typical risk-based inspection program includes a sampling system. This consists of a sampling plan, skip lot schedule, and inspection state switching rules. If you’re thinking about implementing a sampling system for incoming inspection, these three components can provide the structure you need to get started. Sampling plans help to define your sample size or the number of items to be inspected from each lot of incoming material.When you choose a sampling plan, like the commonly used ANSI/ASQ Z1.4, you’re setting a baseline level for the percentage of defects you’re willing to tolerate for each measured characteristic. The percentage may be 0%, which means 100% inspection for your most critical product characteristics. For less critical characteristics, you may choose a different percentage to measure (typically between 2.5-4.0%). This level is called your Acceptance Quality Level, or AQL. Based on your AQL, the sampling plan defines how many items to inspect for a given lot size. Typically, the lower the AQL, the higher the sample size you’ll need to ensure statistical confidence in a material’s quality. The incoming inspection sampling plan also defines how many defects are allowed for the lot to still pass inspection. A skip lot schedule details how many lots need to be inspected out of the total number of lots that you receive. Just like the sampling plan, your skip lot schedule can vary based on past supplier performance or based on a material’s risk. You may decide to vary the inspection schedule for certain raw materials, while you may have other materials that need no incoming inspection at all. Switching rules are also based on a statistical plan that modifies the inspection schedule while maintaining confidence that incoming quality will remain high. For this reason, you should try and stick with an industry-standard plan rather than creating your own skip lot schedule. Sampling systems may be difficult to track in a risk-based inspection environment. Industry standard sampling tables can be detailed and complex. Manual inspection management processes can make it challenging to understand each material’s quality performance over time. These factors can make it difficult to determine sample size, skip lot frequency, and switching schedules for an organization’s many suppliers and raw materials. Fortunately, electronic Inspection Management solutions can completely automate risk-based inspection processes. 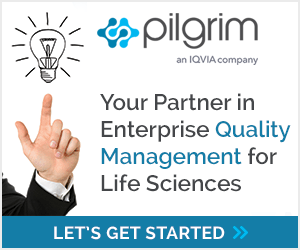 Tools like SmartSolve Supplier Quality Management from Pilgrim Quality Management, an IQVIA company, combine industry-standard sampling systems with your ongoing supplier performance data to notify your team when inspection is needed. You can have all the benefits of risk-based inspection without the administrative and statistical headaches. In the Life Sciences industry, compliance should be at the forefront of every incoming quality decision. Remember to consider the compliance aspects of your sampling choices. It is critical that you clearly document the sampling system you decide to use, and statistically validate the sampling system that you use. It is also important to remember that sampling systems should only be implemented if you have confidence in a supplier’s previous quality performance. Be sure that you’ve documented any audits, inspections, nonconformance history, or other records in support of this decision within your quality management system. While the business and regulatory requirements that impact every device manufacturer’s supplier operations are growing more stringent, Pilgrim Quality Solutions provides support for the processes integral to a compliant and successful supplier quality management program. With an eco-system of supplier quality modules, Pilgrim is empowering organizations to evaluate, track, report on, and rate suppliers to tackle the challenges presented by a complex supply chain. Regulatory Drivers of Supplier Quality Management in the Medical Device Industry (Part 2 of 4).